Reflectance Confocal Microscopy (RCM) is a non-surgical alternative to skin biopsy. The laser-assisted imaging device delivers cellular level, detailed, black and white images of moles and suspicious lesions for physician analysis of potential malignancy. 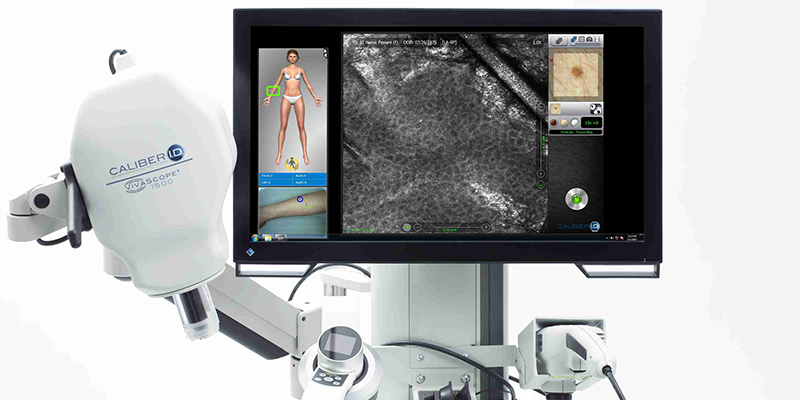 RCM allows diagnosis of melanoma with 95% sensitivity and 86% specificity, making it one of the most accurate non surgical diagnostic techniques in dermatology. Reflectance Confocal Microscopy captures images of cellular activity within the epidermis without the need for biopsy and laboratory evaluation. Similar to ultrasound, Xray, and other imaging technology, RCM relies on image reflection from an energy source. In RCM, the energy source is light, created by a laser. The use of RCM in combination with dermoscopy provides physicians with a more powerful analysis of potentially harmful lesions without the need for surgical removal. If a physician notes signs of malignancy during RCM, a biopsy will be taken for further evaluation. SCARS Center skin cancer specialists recommend a minimum of one professional skin examination per year. Call now to schedule your appointment.